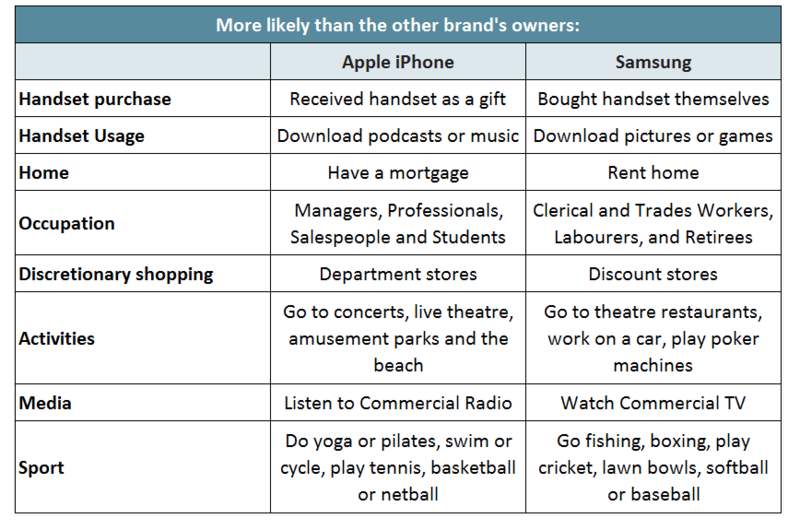 In one of the odder studies to come across the B&T news desk of late is the latest from Roy Morgan that looks at the habits of Samsung and Apple smartphone users in Australia. According to the study, there are 16.2 million smartphones in Australia that are either Apple or Samsung with Apple outselling its rival 7,653,000 to Samsung’s 5,120,000. The study found that Apple users tended to be female (54 per cent), their average age was 41, they earned $54,000pa and 92 per cent agreed they were satisfied with their handset. When it came to Samsung, they were slightly more favoured by the fellas (51 per cent), the average age of the user was 44, average salary was $47,000pa and (despite the recent problems of handsets exploding) 88 per cent said they were satisfied with their device. Owners of an iPhone are the more likely of the two groups to download podcasts or music, while Samsung owners are more likely to download pictures or games. Apple users are more likely to have received their phones as gifts, while Samsung users are more likely to have purchased theirs. Compared with Apple’s users, more of Samsung’s rent their home, work in sales, clerical or trades roles (or are retired), shop at discount stores, watch commercial television, go to theatre restaurants, play pokies, work on the car, go fishing, or play sports like cricket, lawn bowls, softball or baseball. While Apple users – with its female bent – are more likely to have a mortgage, work as managers and professionals (or be students), to go to concerts, live theatre, amusement parks and the beach, to listen to commercial radio, and do yoga or pilates. 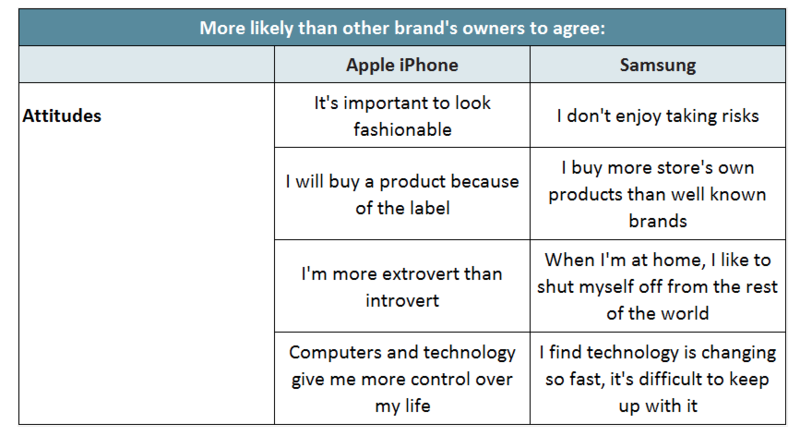 A higher proportion of Apple owners said it was important to look fashionable and that they’ll buy a product because of the label. While more Samsung owners are wary of risk and happy to buy store’s own products over brand names. Where Apple owners are more extroverted, Samsung owners enjoy their quiet time at home. Where more Apple owners believe technology gives them more control, Samsung owners are more likely to say they find it difficult to keep up with technological change. Commenting on the study’s findings, Roy Morgan CEO Michele Levine said: “Almost 13 million Australians use either an iPhone or a Samsung handset as their main mobile phone—representing almost four in five smartphones between them. “The majority of both brands’ future handset sales will be to existing owners. Some 52 per cent of all smartphone owners intend to upgrade their handset at some point, including 23 per cent looking to buy within the next 12 months. “Unless there is a compelling reason to switch, most consumers prefer to stick with what they know. It is therefore imperative that brands fully understand their own and their competitors’ current users,” she said.